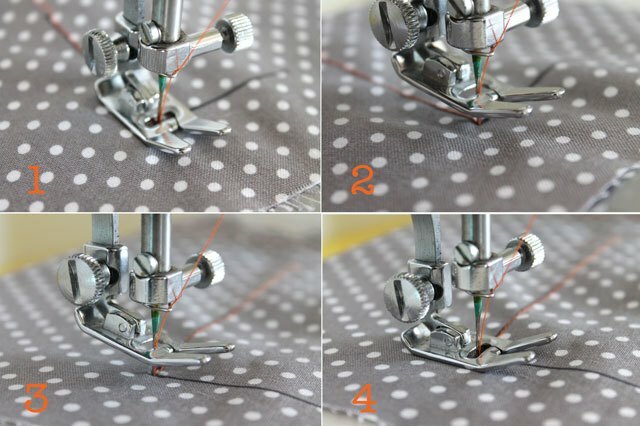 Now that you’ve mastered how to thread your machine and fill a bobbin, let’s get to the fun part of sewing — learning to stitch. 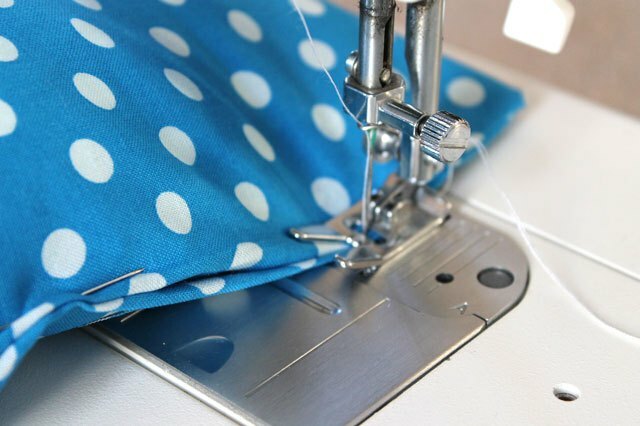 Today, you’ll learn to sew a straight stitch, basting stitch, gathering stitch, zig zag stitch, reverse stitch, how to turn a corner and how to make a buttonhole. Then you’ll practice your newfound skills by creating your own pillowcase. So, pick out a scrap piece of fabric, turn on your machine and crank up those tunes, because THIS is where your sewing adventure begins! The straight stitch is the most common stitch used when sewing. 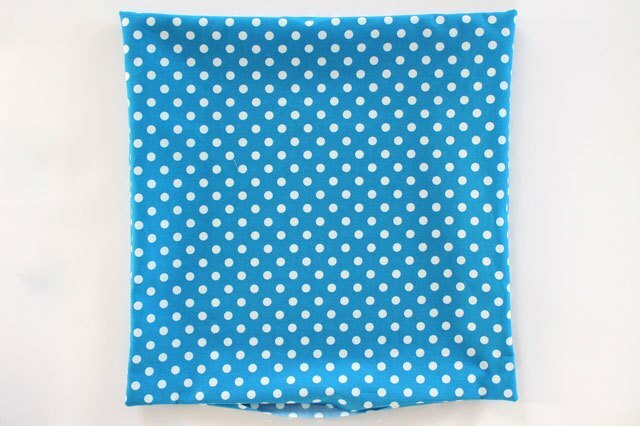 It’s used for most seams in garments, craft projects and home decor. 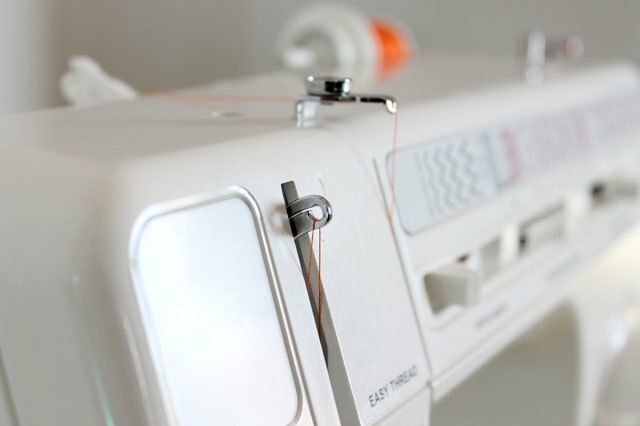 The machine is usually set on a medium stitch length when sewing a seam. Before you sew anything, you’ll want to make sure that both the top and bottom threads are under the presser foot and pulled out about 3 or 4 inches. 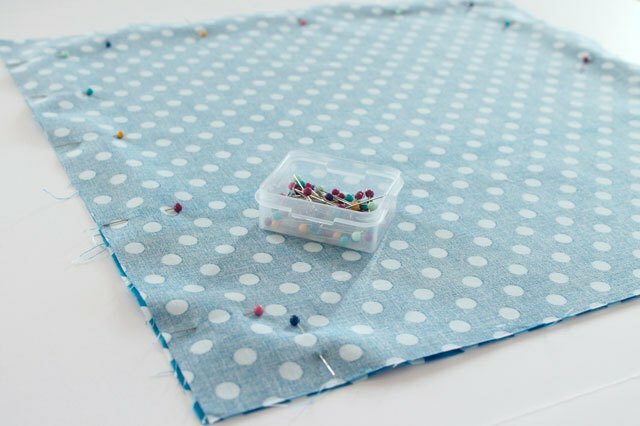 You’ll also want to make sure the needle is in the highest position so when you start to sew, the threads won’t get tangled and knotted together. Put the needle in the highest position by using the hand wheel and turning it slowly toward you while you continue to hold onto the ends of the thread. Then place the fabric under the presser foot and place the presser foot down onto the fabric using the presser foot lever. The presser foot lever is located on the back of the machine above the needle. 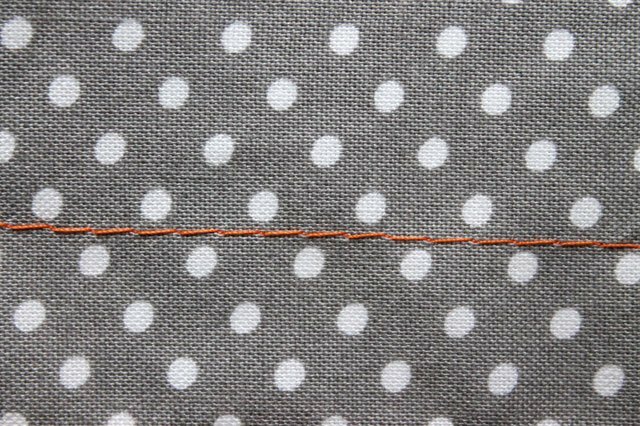 Line up the edge of your fabric along a line on the right side of the needle plate to practice your stitches. 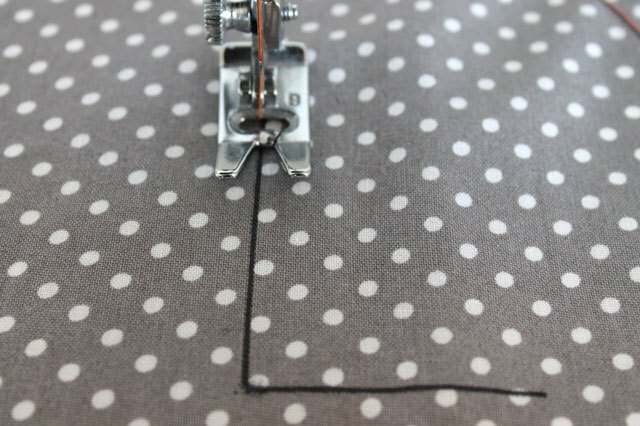 The lines are there to guide your sewing and keep the stitch lines straight. They are divided into 1/8th-inch increments. 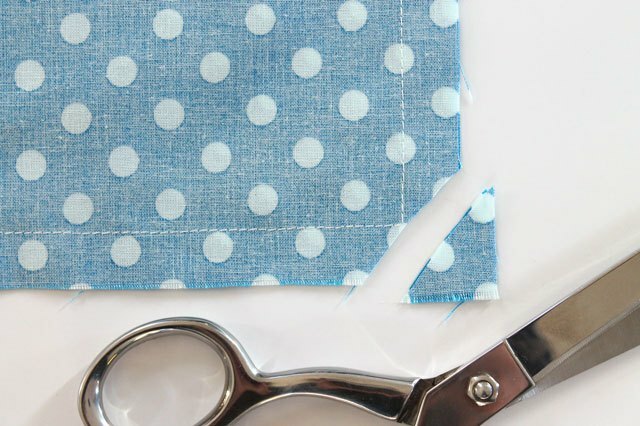 When sewing seams, most patterns and directions will tell you how wide to make the seam allowance — a typical seam is 1/2 inch or 5/8 inch wide. Slowly press down on the pedal as you guide the fabric with your hand along the line on the needle plate. You won’t need to pull or push the fabric through because the feed dogs (the little metal bars with crosscut teeth under the presser foot on the needle plate) will move the fabric through for you. 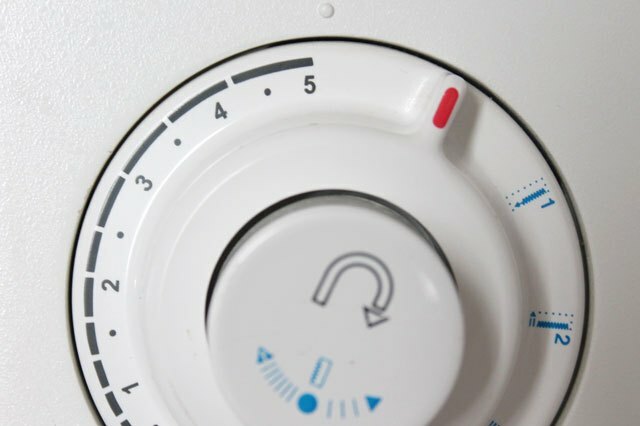 Keep going slowly until you get a good feel of the speed of your machine. 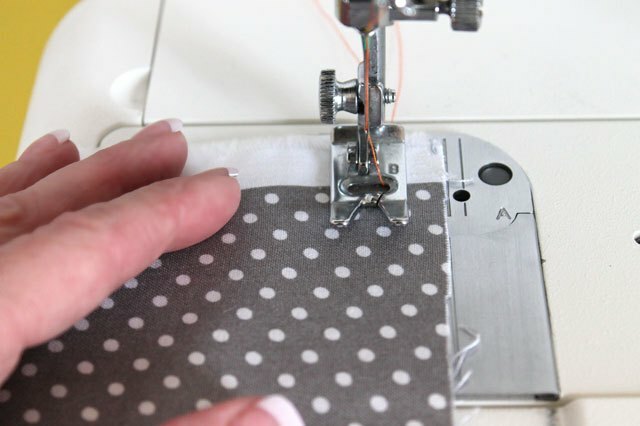 When you get to the end of the fabric, stop, push in the reverse button on your machine, make three or four stitches in reverse, then release the reverse button and stitch three or four forward stitches. This will lock your stitches in place and prevent the seam from coming apart. Now make sure the needle is in the highest position again, lift up the presser foot, pull the fabric out and snip the thread with scissors. Make sure you leave a few inches of thread on the machine side so the needle will stay threaded. A basting stitch is used when you want to temporarily keep something in place. 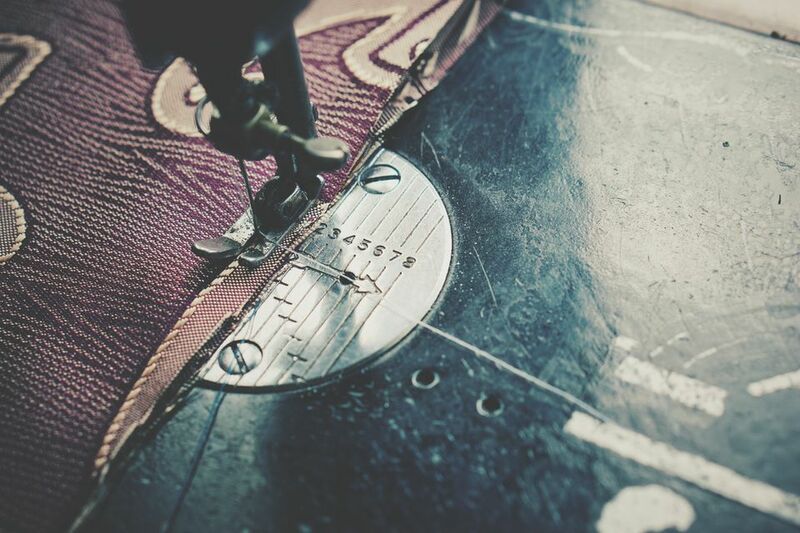 Basting is usually used when fitting garments and is sewn on the regular seam line. The machine is placed on the longest stitch length when basting. The long straight stitches will allow you to remove stitching easily, if need be. Permanent stitching can be sewn directly over the basting stitch if everything fits correctly, or the basting stitches can be simply removed if adjustments are necessary. A gathering stitch is also set on the longest stitch length and is used when you want to draw in fullness to match another portion of a project like on a ruffle or a skirt. Once again, before you start to practice the basting and gathering stitch, put the needle in the highest position, make sure both the top and bottom threads are under the presser foot, place the fabric under the presser foot and release the presser foot lever so the presser foot is holding the fabric securely in place. 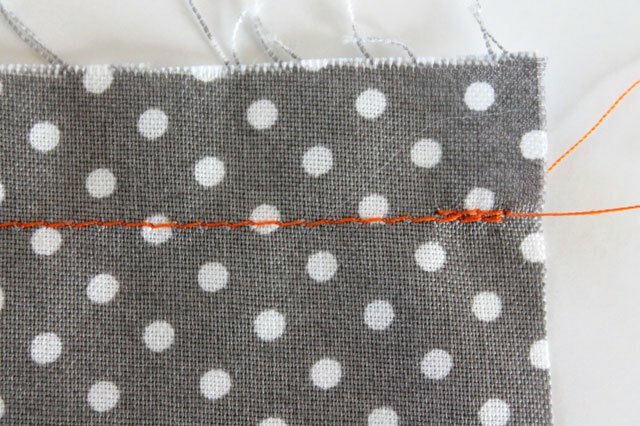 Line up the edge of the fabric along the 1/2 inch line and slowly press down on the pedal to begin sewing. When you sew a basting and gathering stitch, you will not be sewing backward stitches at the beginning and end. 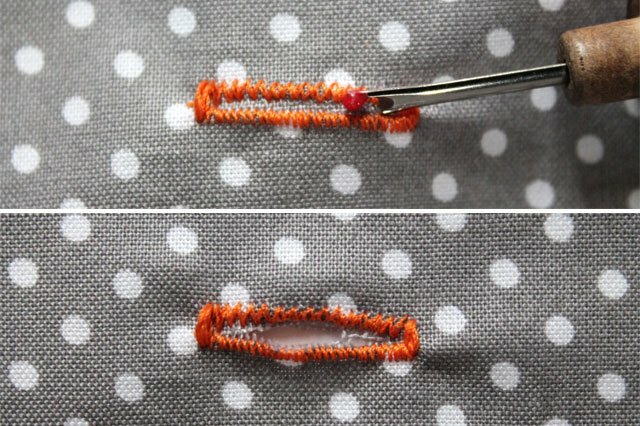 A zig zag stitch takes one stitch to the right and the next stitch to the left. It is used for seams and hems when sewing with knit fabrics because it allows the fabric to stretch without causing the threads to break. 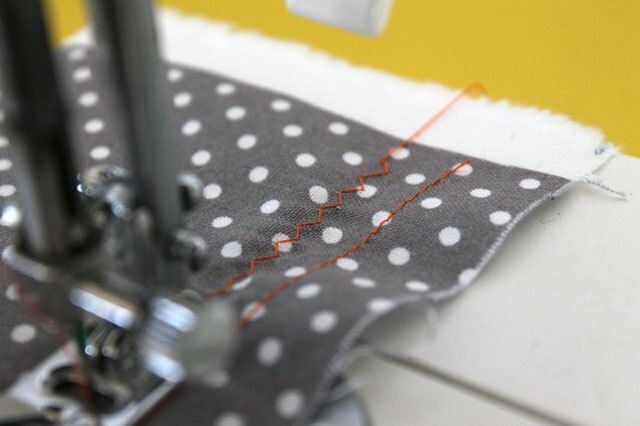 A zig zag stitch can also be used to finish the edges on seams to prevent the fabric from fraying. 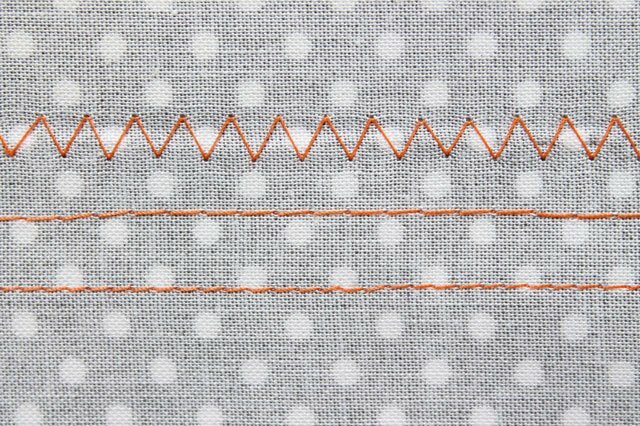 To sew a zig zag stitch, you’ll need to adjust your machine settings to the desired width and length of the zig zag stitch. Again, starting with the needle in the most upright position, make sure both threads are under the presser foot, place your fabric under the presser foot, line up the edge of the fabric on the 5/8-inch line and press down on the pedal slowly. 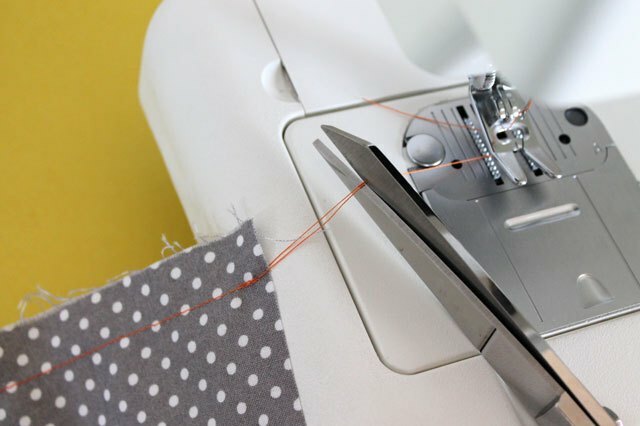 Experiment with the different stitch widths and lengths by changing the settings on your machine. 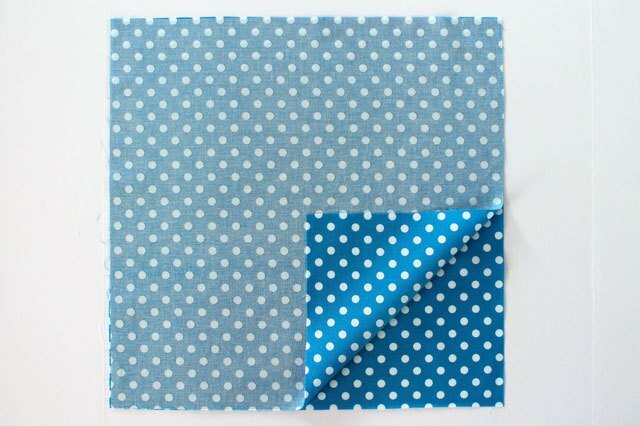 To practice making a 90-degree turn when sewing, draw a line with a 90-degree angle on your practice fabric. Start on one end of the line and sew down to where the line changes direction (1). Keep the needle down in the fabric and lift up the presser foot (2). Turn the fabric so you are heading in the direction of the new line (3). Put the presser foot back down and continue sewing to the end of the line (4). Buttonholes are small reinforced slits in the fabric used for fastening a button. 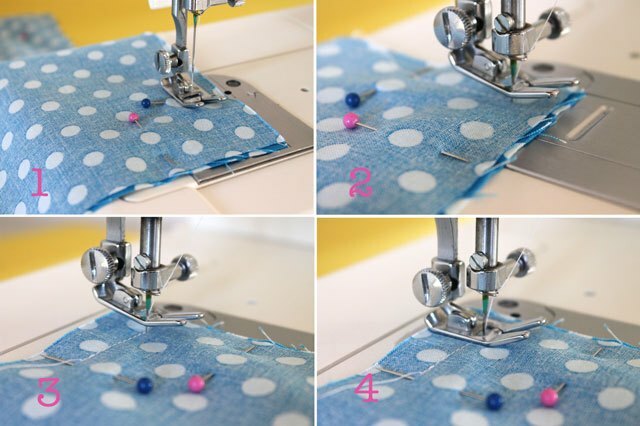 Most newer machines are set up to make buttonholes without even moving the fabric or repositioning the needle. It’s a good idea to always practice a buttonhole on a scrap piece of fabric before making one on your garment. Before making a buttonhole, always make sure your bobbin is full. You may have to change the foot to a buttonhole foot if your machine comes with one. 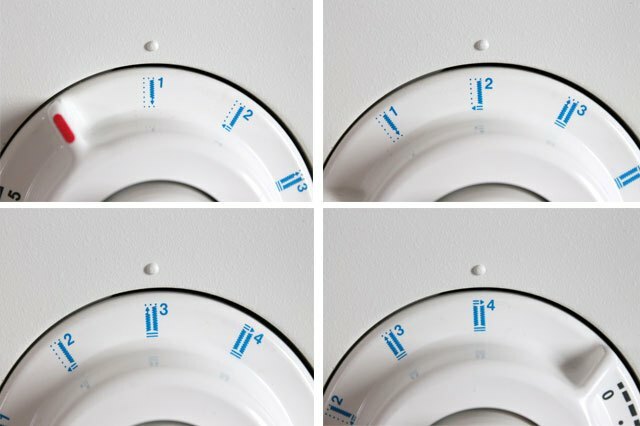 Each machine will create a buttonhole differently, so you’ll need to consult your machine’s manual, but here is an example of how this particular machine works. First, mark the buttonhole position on the fabric as indicated in your pattern. Lift the presser foot and place the fabric under the foot, starting at the top mark of the buttonhole. Turn the buttonhole dial symbol to 1 and stitch down the end mark of the buttonhole. Raise the needle up out of the fabric and turn the buttonhole dial symbol to 2 and make five back-and-forth stitches. Raise the needle up out of the machine and turn the buttonhole dial symbol to 3 and stitch up the other side of the buttonhole back to the starting point. Lift the needle up out of the fabric and turn the buttonhole dial symbol to 4 and make five back-and-forth stitches. Raise up the needle and the presser foot to remove the fabric from the machine. Clip the threads. 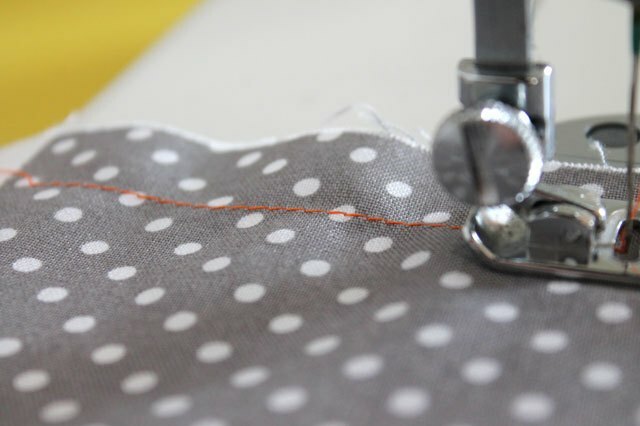 Use a seam ripper or a sharp pair of small scissors to carefully cut open the buttonhole opening. Whew! 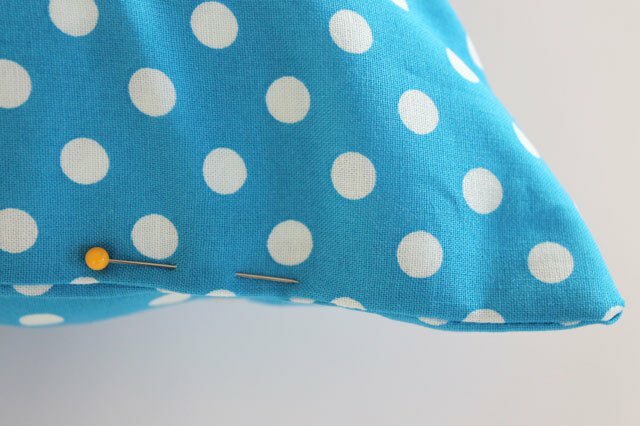 Now that you’ve practiced your stitches, you’re ready to make your first project. 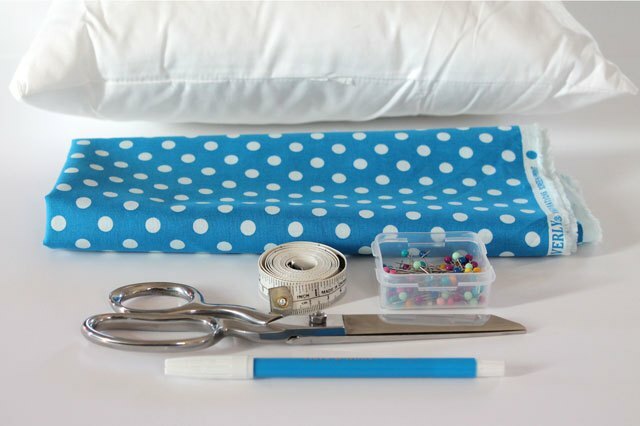 Let’s make a pillowcase! 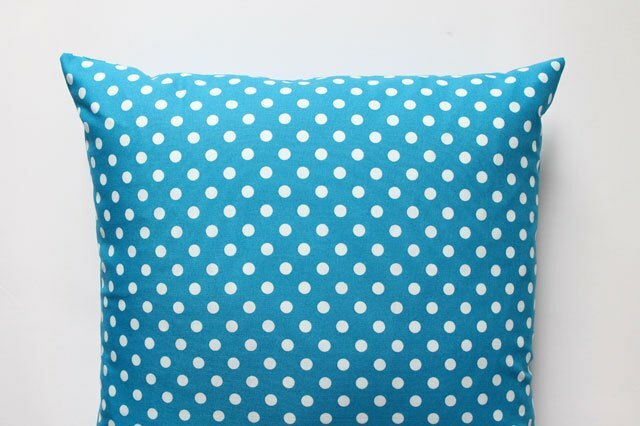 First, to determine the fabric dimensions, measure across the pillow form from seam line to seam line. Add 1 inch to this measurement to allow for a 1/2-inch seam allowance on each side. 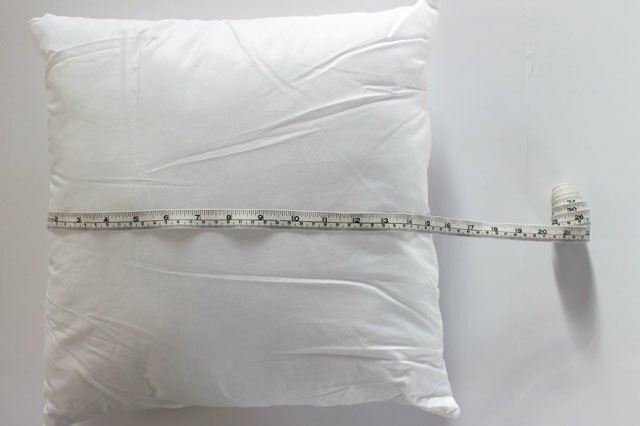 For example, if your pillow measures 14 inches on each side, then 14+1=15. Your fabric dimensions would be 15 by 15 inches. Cut two pieces of fabric to the dimensions you determined above. Place the two fabric pieces together with the right sides together. The right side of the fabric is the side that has the pattern or design you want to be visible when the project is complete. Pin along the edge of three of the sides. On the fourth side, you will only pin 2 inches in from each edge. This will be your starting point and your ending point. You will leave most of the fourth side open so you can slide the pillow in through the opening later. Start sewing on the unpinned side 2 inches in from the edge. Line up the edge of the fabric with the 1/2-inch line. To lock the stitching in place, sew forward three or four stitches, then sew backwards three or four stitches, then forward again. 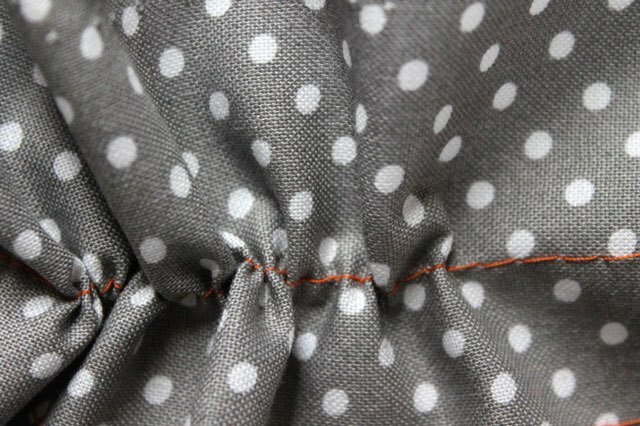 When you get 1/2 inch away from the next edge, stop sewing and make sure the needle is down in the fabric (1). Then lift up the presser foot (2). Turn the fabric so the edge of the next edge is along the 1/2 inch line (3). Put the presser foot down again (4), and continue sewing until you get 1/2 inch away from the next edge. Repeat the turning process and continue sewing a 1/2-inch seam until you get to the last edge. 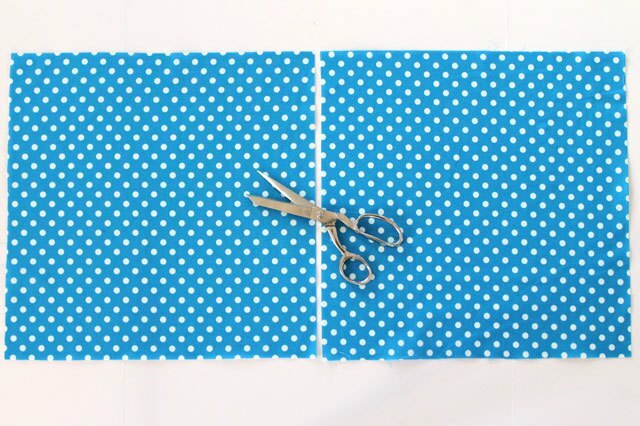 Use a sharp pair of scissors to carefully clip each of the corners at a 45-degree angle. Be sure to not clip the stitching. 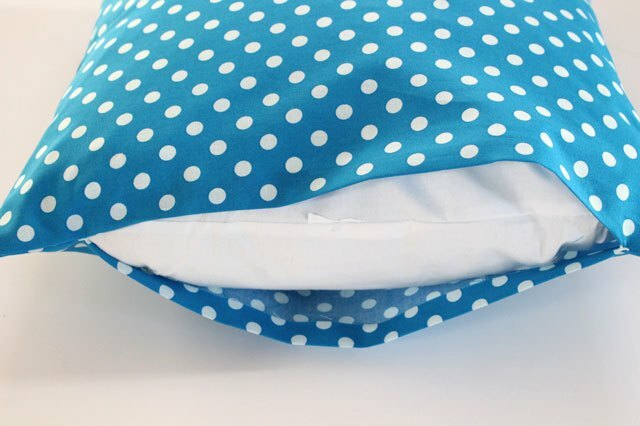 This will reduce the bulk and help the corners lie flat when you turn the pillowcase right side out. Turn the pillowcase right-side out by pulling the fabric through the open side. Use your finger or a chopstick to push each corner all the way out. Sew along the edge of the opening, making sure to remove the pins as you sew. TAH-DAH! Congratulations, you’ve just made your first project! Next you’ll learn how to choose the right fabrics and patterns, how to read a pattern envelope and how to read the pattern itself. You’ll even learn how to cut out a pattern. Stay tuned for more sewing adventures!